Simpson Cabinetry was a part of this award winning kitchen renovation. We re-faced all the existing cabinetry and custom build the rounded peninsula. Read more on the entire project as written by the builder, Peregrine Design/Build. It’s not very often that we get to design a new commercial kitchen for upstart entrepreneurs. Our clients own a salad dressing company called Well Dressed Greens and make their product out of their Burlington home. Three generations of women carry on the tradition of crafting small batch vinaigrettes based on an original French recipe. The dressings are sold locally at stores and farmers markets. Since the cottage industry was launched three years ago the level of activity had taken a toll on the laminate kitchen cabinets which were falling apart. The owners also knew their kitchen could be better organized. Most cooks have the standard pantry items but this kitchen uses bulk quantities of oil, Dijon mustard, fresh garlic, sea salt and ground peppercorns, and having a large work surface on the center island was paramount. In addition to improved storage and access to tools and equipment, our clients wanted a clean look and feel but did not have a big budget. Working to keep costs down, our architect designer focused on reusing the existing granite countertops and many of the cabinet boxes which were re‐faced with seamless contemporary maple doors. Refrigerator and freezer door panels were also made to coordinate. 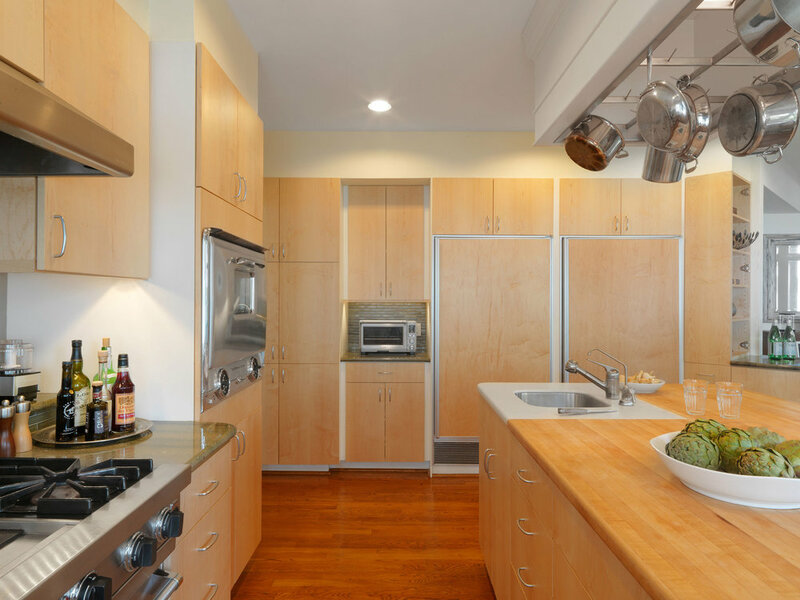 The island was rebuilt for specialized storage and the functional needs of a cooks kitchen, with the large maple butcher block top taking center stage. A small prep sink in the corner of the island is set in solid surface Corian to keep counters from getting too wet near this work area. In the center of the island a large canopy held many well‐used pots. While the exterior trim was in good condition, its center grid – made of painted wood – was peeling and splitting. 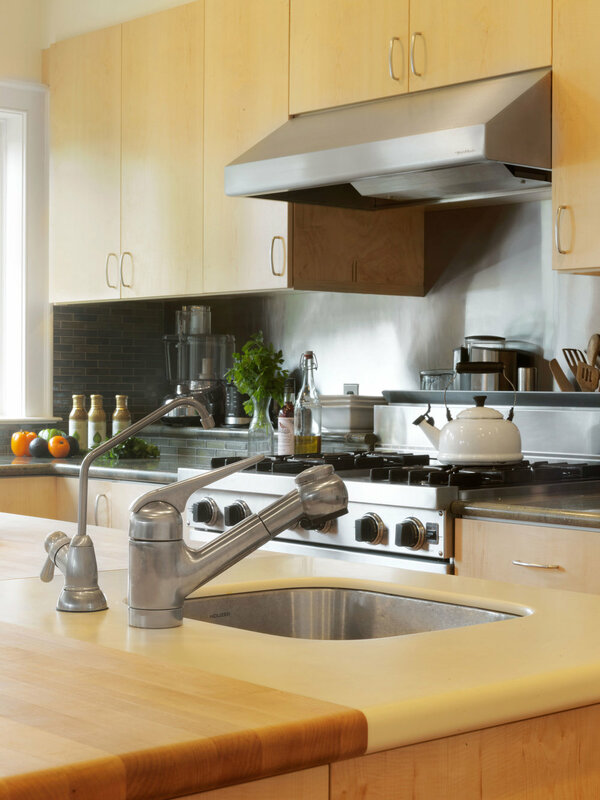 The solution was to retrofit it with a new custom stainless steel hanging pot rack system that is infinitely more durable and stylized to the overall contemporary design. The oak floors were patched with precision and care. We removed the old dated white tile wall splash behind the stove and replaced it with a seamless piece of stainless steel that ties into the range hood. A special shelf at the range wall was built for everyday appliances to be readily available. The stainless steel gives a commercial look and is easy to clean. We think it’s a huge improvement over the old tile and is further highlighted by new LED under cabinet task lighting. The white tile backsplash above the double sink was removed and new smoky green glass tile was selected to compliment the existing granite countertops which are a hazy loden color. The glass also relates well to the views of Lake Champlain directly outside. A peninsula that had been a cluttered desk area andunderutilized open kick space was rebuilt with custom cabinetry to give additional storage and surface work space. The rounded front added a special custom cabinetry look to finish the end. Off the kitchen, a pantry was also remodeled with a deep pot sink for high volume cleaning and a commercial size faucet. Floors were updated with Marmoleum resilient flooring for durability and easy clean‐up. Good design planning and selection of materials have given this kitchen a brand new look for a low amount of investment. And now we have a great brand of salad dressings to recommend!